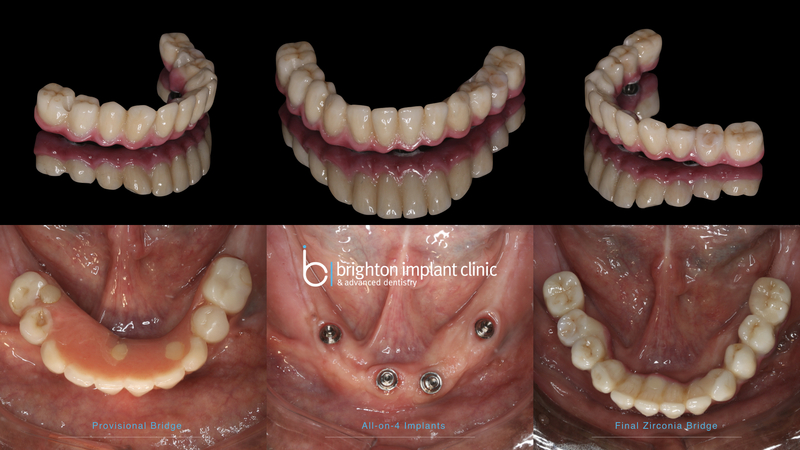 All on 4 photos showing some examples of all on 4 treatments completed at Brighton Implant Clinic. This solution provides excellent aesthetics and function for those patients who lost all their teeth or removed them due to gum disease. The all on 4 dental implants solution is an advanced treatment option for those patients with multiple missing teeth and struggle to cope with removable dentures. 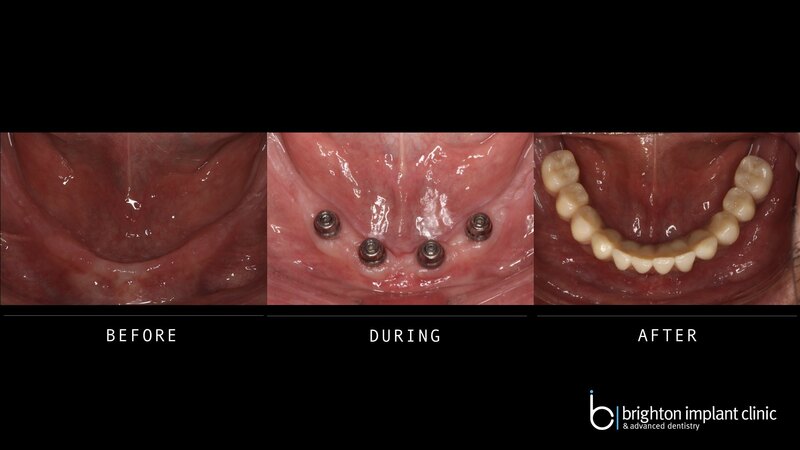 Using just 4 dental implants, it is possible to support a fixed bridge of 10-12 teeth. As can be seen with these photos shown above the implants can restore confidence, function and look just like natural teeth. Unlike dentures dental implants are comfortable and do not move around. Many patients think that to replace a whole jaw of missing teeth you need to use an implant for each missing teeth. However using the all on 4 solution, a full arch of missing teeth can be supported on 4 implants. Usually the surgery is carried out under intravenous sedation and also with local anaesthetic for maximum comfort. A fixed provisional bridge is usually fitted on the same day of surgery, so patients are never without teeth. We have our own in house dental laboratory to make the same day bridges possible. In some cases it is not possible to fit a provisional bridge (if implant stability is inadequate or cases with limited bone volume). The all on 4 solution can be used for the upper or lower arches. Sometimes it may be necessary to place more than 4 implants. During the initial implant assessment your dentist will assess the amount of bone structure available for dental implant placement. In some cases where very limited bone is available an implant overdenture may be the best solution. I have osteoporosis, therefore not good bones. I had fixed implants in my lower mouth that are now 14 years old and still good. Only wish I had the top done also. I hate dentures but guess I have no alternative. Its true that osteoporosis poses a risk for dental implant treatment. The upper jaw also is generally more complex to treat. If the upper teeth have been missing for several years then the amount of bone available may be limited. I would recommend that an assessment be carried out if it has not already been done to see if anything could be done. A second opinion could provide a different perspective about the options/risks and possibility of treatment.